O programa detalhado de Cursos Avançados disponibilizados pelo cE3c – Centro de Ecologia, Evolução e Alterações Ambientais para o ano lectivo 2018/2019 já está disponível. São 19 cursos, dos quais 4 são oferecidos pela primeira vez. - Biologia e Ecologia das Alterações Globais – BEAG (Univ. de Lisboa e Univ. de Aveiro). Os cursos têm em geral formato intensivo, com duração de uma semana, sendo reconhecidos para o 1º ano dos Programas Doutorais de estudantes da Faculdade de Ciências da Universidade de Lisboa (FCUL; 5-6 ECTs). Alguns têm um formato mais curto (ver detalhes nos programas de cada curso). Está já disponível o cartaz de divulgação (à esquerda). Mais detalhes (incluindo programas, preços e procedimentos para inscrição) podem ser consultados aqui. The detailed program of the Advanced Courses organized by cE3c – Centre for Ecology, Evolution and Environmental Changes for the academic year 2018/2019 is already available. There are 19 courses in total, of which 4 are new. - Biology and Ecology of Global Changes – BEAG (Univ. of Lisboa and Univ. of Aveiro). 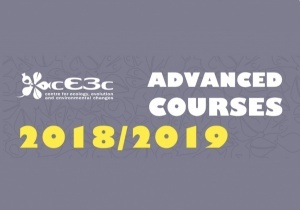 The courses have in general an intensive format, with one week of duration, being recognized for the 1st year of the Doctoral Programmes of PhD students of the Faculty of Sciences of the University of Lisbon (FCUL; 5-6 ECTs). Some have a shorter format (see details in each course’s programme). The advertising poster is already available (on the left), and we detail below the list of courses, corresponding teachers and calendars. More details (including programmes, prices and procedures for applications) can be found here. October 15-19, 2018 - Entomological Collections, Insect Systematics and Evolution (Luís Filipe Lopes et al.). Deadline for applications: September 15, 2018. October 22-26, 2018 - Bioinformatics analysis of biological sequences (Teresa Nogueira & Rita Ponce). Deadline for applications: September 28, 2018. 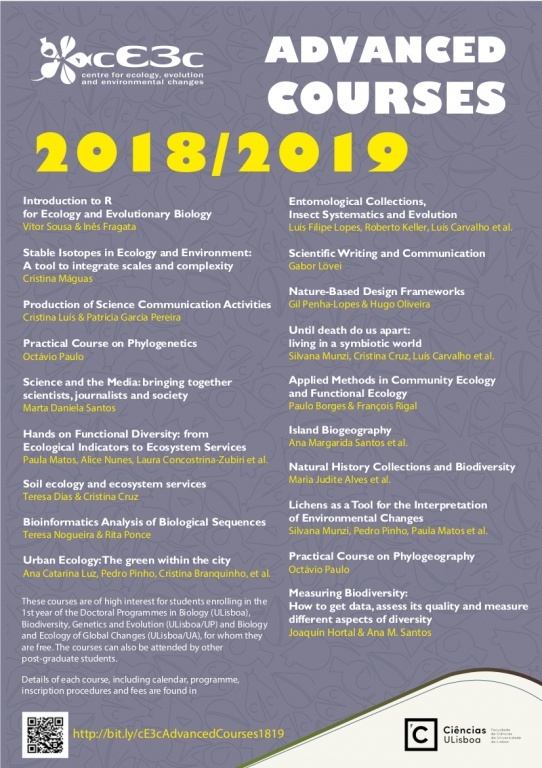 November 5-9, 2018 - Natural History Collections and Biodiversity (Maria Judite Alves et al.). Deadline for applications: October 12, 2018. November 12-16, 2018 - Production of Science Communication Activities (Cristina Luís & Patricia Garcia Pereira). Deadline for applications: October 12, 2018. January 7-11, 2019 - Scientific Writing and Communication (Gabor Lövei). Deadline for applications: November 30, 2018. January 14-18, 2019 - Hands on Functional Diversity: from Ecological Indicators to Ecosystem Services (Laura Concostrina-Zubiri, Paula Matos, Alice Nunes et al.). Deadline for applications: December 14, 2018. January 21-24, 2019 – Island Biogeography (Ana Margarida Santos et al.). Deadline for applications: December 14, 2018. January 28 - February 1, 2019 - Soil ecology and ecosystem services (Teresa Dias & Cristina Cruz). Deadline for applications: December 28, 2018. February 4-8, 2019 - Until death do us apart: living in a symbiotic world (Silvana Munzi, Cristina Cruz, Luis Carvalho, et al.). Deadline for applications: December 14, 2018. February 4-8, 2019 - Practical course on Phylogenetics (Octávio Paulo). Deadline for applications: January 11, 2019. February 11-15, 2019 - Introduction to R for ecology and evolutionary biology (Vitor Sousa & Inês Fragata). Deadline for applications: January 11, 2019. 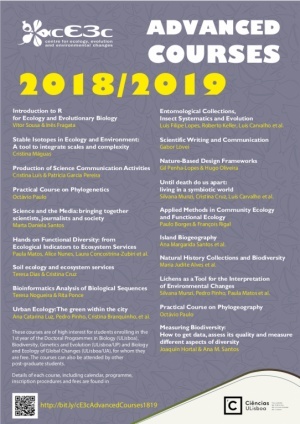 February 19-22, 2019 - Urban Ecology: the green within the city (Ana Catarina Luz, Pedro Pinho, Cristina Branquinho, et al.). Deadline for applications: January 18, 2019. March 18-20, 2019 - Science and the Media - bringing together scientists, journalists and society (Marta Daniela Santos). Deadline for applications February 15, 2019. May 13-17, 2019 - Nature-Based Design Frameworks (Gil Penha-Lopes & Hugo Oliveira). Deadline for applications: April 19, 2018. June 3-7, 2019 - Practical course on Phylogeography (Octávio Paulo). Deadline for applications: May 10, 2019. 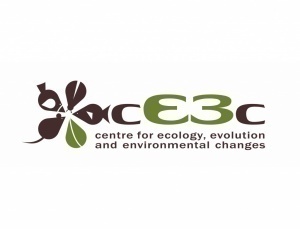 June 17-21, 2019 - Applied Methods in Community Ecology and Functional Ecology (Paulo Borges & François Rigal). Deadline for applications: April 26, 2019. June 24-28, 2019 - Measuring Biodiversity: How to get data, assess its quality and measure different aspects of diversity (Joaquín Hortal). Deadline for applications: May 31, 2019. July 8-12, 2019 - Stable isotopes in Ecology and Environment: a tool to integrate scales and complexity (Cristina Máguas). Deadline for applications: June 1, 2019. July 15-19, 2019 - Lichens as a Tool for Interpretation of Environmental Changes and Management (Silvana Munzi, Pedro Pinho, Paula Matos et al.). Deadline for applications: June 7, 2019.